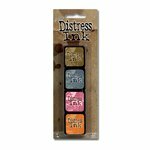 Ranger Ink and Tim Holtz make organization and transport a breeze! This 4.25" x 6.25" Mini Distress Ink Storage Tin is designed to hold up to twelve 1" x 1" Mini Distress Ink Pads (sold separately) and includes a divider for easy accessibility. The tin is light-weight and features a hinged lid and an easy-to-see-through clear window. One tin box is included in the package. 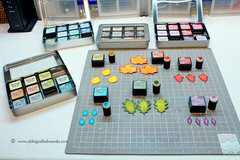 I love the mini distress ink pads, so this was a very nice idea for storing them. 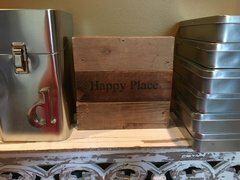 They stack well, but by storing the mini pads in this tin, you can see the colors and names so easy. Very happy I made the purchase, and will most likely purchase more. 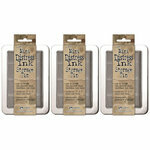 Love, love, love this cute little tin that can hold most little mini inks, not just Tim Holtz. Love the fact that they are held snugly in their own little compartments so they don't fly around and the ink pad covers stay on so the inks don't dry out. The clear top lets you see easily what color you need for your project. I have ordered at least 6 or 7 of these now and just when I think I have enough I fill another one up! 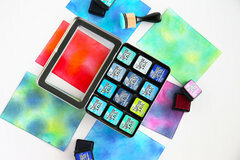 These little tins don't just hold Tim Holtz mini cubes, all sorts of other mini ink cubes can fit in them, as well as anything else you can think of. I love the sturdiness of the tin, but with the see through lid, so you don't have to open them to see what is inside. Highly recommend them for anyone who needs to organize! 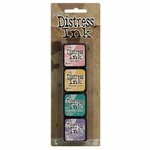 I ordered enough of these to hold all 15 sets of Mini Distress pads that I own.....I am sure I will be ordering more as T. Holtz releases more ink colors. I bought them thinking they might make the pads stay wet longer, being sealed in the tins, also because it makes it easy to transport the pads when going somewhere to work on crafts. I like them very much. 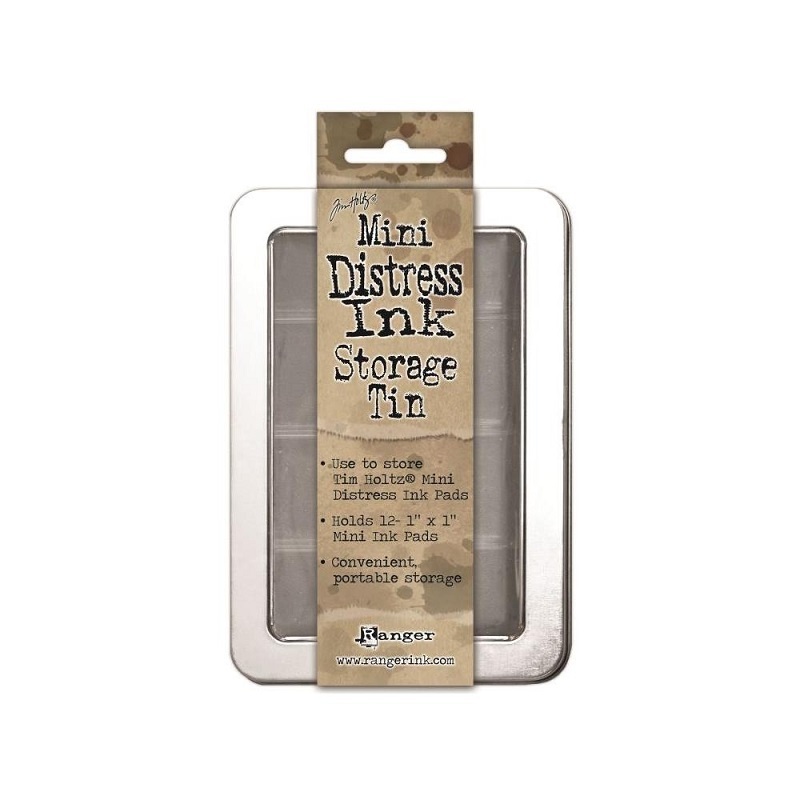 If you like the Tim Holtz mini distress inks the storage tin is very helpful. I am glad I ordered this item. 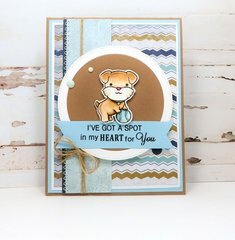 This is the perfect size item for coraling all those small distress inks and being able to keep them from opening and also being able to find the color you need quickly. I love the Tim Holtz tins, because the lids on the mini distress ink pads pop off very easily! The tin has an insert that has 12 sections that your minis nest into, and the lid fits snugly and it protects your mini pads, because once in there, the lids do not pop off the pads. 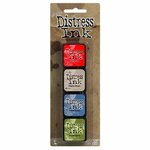 It is well worth the price, as it is much more expensive to replace dried out mini distress ink pads when the lid pops off and you don't notice until they are all dried out. I now have 8 of these tins. They are very useful and just the right size. I'm just starting out purchasing ink pads and storage for these items. 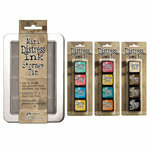 I was interested in the Tim Holtz Mini Distress Inks and Mini Storage Case. All the mini inks are 1.25" X 1.25" but the case shows that it holds 1" x 1" . Will 12 of the 1.25 X 1.25 fit in the 1" x 1" storage case? By: Gram53 (28-Jan-16) Helpful Question? Yes | No Thank you! Report Inappropriate This question has been reported. Thank you! Yes, 12 mini inks fit perfectly in the tin. By: Fido (31-Jan-16) Helpful Answer? Yes | No Thank you! Report Inappropriate This Answer has been reported. Thank you! As stated previously, all of the 12 minis fit exactly in the tin. A great storage solution. By: sp.jackson (31-Jan-16) Helpful Answer? Yes | No Thank you! Report Inappropriate This Answer has been reported. Thank you!